Remember the story of Maxim Shulgin, the Left Bloc activist from Tomsk? He was charged with violating Russian Criminal Code Article 282 for posting songs on the VK social network. 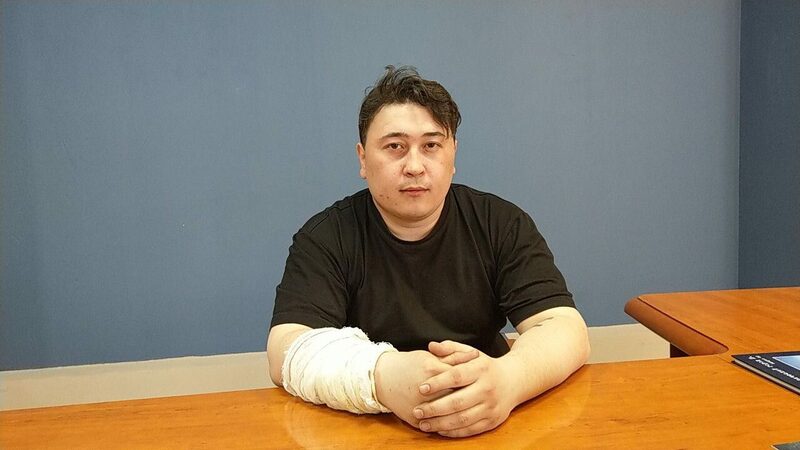 When Center “E” officers searched his flat in April and took Shulgin to their headquarters, they beat him up on the way there and pushed him against the heater in their car, causing burns to his body. We published his account. Other Left Bloc activists were detained the same day. When they refused to testify against Shulgin, they were threatened with violence and told they would be charged with criminal offenses as well. When Shulgin was delivered to Center “E” headquarters with a bandaged arm, they decided the threats were real and answered the investigator’s questions. Now the witnesses have recanted their testimony, recording a video in which they recounted what happened that day. Our attorney Andrei Miller has been working on the Shulgin case. We immediately had Shulgin’s beating certified by a physician, and the evidence has been submitted to the Investigative Committe’s military investigation department. However, the issue of whether charges will be filed in connection with Shulgin’s bodily injuries has not yet been resolved. Maxim Shulgin, a 28-year-old Left Bloc activist from Tomsk, recounted how Center “E” officiers detained him and what happened to him afterwards. Tomsk Center “E” officers raided the Left Bloc’s offices yesterday. The Center “E” officers forced the Left Bloc activists to lie face down on the floor. They confiscated their telephones, meaning the detainees had no connection with outside world until later that night and were unable to tell anyone what had happened to them. The detainees were taken to Center “E” headquarters, while Shulgin was handcuffed and taken home for a search of his flat. “The worst nightmare was in the van. I lay between the front and back seats, and the men put their feet on me. They deliberately turned on the heater under the front seat, although it was three or four in the afternoon and eighteen degrees Centigrade outside. They did this on purpose, so I would find it hard to breathe, and if I hadn’t put my arm against the heater, one whole side of my body would have been burned. ‘Guys, I can’t breathe,’ I said. They kicked me and said, ‘Are you alive down there? Be patient, bro. We’ll arrive soon, and everything will be okay.’ They also beat the left side of my body. When I took too long answering their questions, they would beat me just like that, apparently because they enjoyed it. The Center “E” officers confiscated all the equipment and political campaign materials in Shulgin’s flat. Then they took him to their headquarters, where the other Left Bloc activists were waiting.